Virus causes different diseases in animal and plants. Virus does not produce symptoms directly in the animals (humans). But it indirectly affects the host. I. Some virus stimulates the lysosome of host cell to produce hydrolytic enzymes. These enzymes cause bursting of host cell. These hydrolytic enzymes damage other cells. Sometimes, envelope of the virus is toxic to the body of host. It causes allergic reactions. In some cases, virus DNA incorporates in the DNA of host. It stimulates the genes of host cells. Thus host cell start dividing and produce tumor (cancer). AIDS (Acquired Immuno deficiency syndrome): AIDS is caused by HIV virus. The HIV virus affects helper T-Lymphocytes (a white blood cell). T- Lymphocytes are major component of the immune system. The increase of infection of the HIV decreases the number-of T- Lymphocytes. It results in failure of immune system. So the infected person is attacked by many diseases. The HIV also infects the cells of the central nervous system (brain and spinal cord). Its symptoms are sudden weight loss, swollen lymph nodes and general loss of immunity. Cancer: Some retroviruses have special genes called oncogenes. These viruses are called tumor viruses. These viruses inject these genes into host cells. Thus divisions start in the host cells. Itproduces tumor. The cell of this tumor may spread to other part of the body and cause cancer. Hepatitis: The inflammation of the liver is called hepatitis. It is caused by viral infection. It has different types like Hepatitis A, B, C, D etc. Its symptoms are: Jaundice, abdominal pain, Liver enlargement, Fatigue and sometimes fever. It may be mild. Sometimes it is acute and can cause liver cancer. Polio: Poliomyelitis is caused by polio virus. It is present all over the world. It occurs mostly in childhood. The polio virus is the smallest know virus. It contains RNA in spherical capsid. Polio virus attack on nervous system. It makes the children handicapped. S. Influenza and cold: These are caused by influenza and cold virus. It is an enveloped RNA virus. Influenza and cold is a wide spread disease. It occurs in epidemic form. Both these diseases infect the respiratory tract. Small pox: Small pox is caused by pox virus. It is a DNA enveloped virus. Small pox was common disease of the world before early twentieth century. Raised vesicles are formed on the body. These vesicles are fluid – filled. Later, these vesicles changes into pustules. These pustules later forms pitted scars. These scars are called pocks. Mumps and Measles: Mumps and Measles viruses are belonged to group Paramyxoviruses. They are large and RNA enveloped viruses. Herpes Simplex: It is caused by Herpes virus. It is a DNA virus. It is naturally occurring disease of mankind. It forms vascular lesions in the epithelial layers of the ectodermal tissues. This disease occurs in the mouth, on the lips and at other skin sites. Plant viruses are serious agricultural pests. They stunted the growth of plants. Thus crop yield is lowered. Once plant virus enters into a plant, it spreads in all its part through plasmodesmata. It is almost impossible to control plant viruses. Therefore, scientists are preparing virus free varieties. There are following viral plant diseases. 1. Tobacco Mosaic Virus (TMV): TMV is RNA virus. Its capsid is coiled rod like. It attacks on the leaves and stem of plant. The leaves become wrinkle and molted. Mosaic appears due to molting. These mosaics are present in the form of light green spots. The leaves become narrow and stunted. The plant soon loose vigor and start dying. TMV spread by mechanical rubbing of leaves. It is also s read b infected seeds. Mosaic virus of cucumber and lettuce: Virus also causes mosaic in cucumber and lettuce plants. These viruses are mostly spread by pest like aphids and leaf hoppers. Yellow disease of Potato: It infects the leaves, stems and roots of plant. It ultimately destroys the plant. Tomato bunchy top disease: It is caused by infectious particles called viroid. The tomato plant fell down wilt and become dry. Cotton leaf curl Viruses (LCV): This virus attacks on cotton plants. It caused huge cotton losses in Pakistan in previous years. LCV is spread by white fly named Bemisia tabaci. Its symptoms are thickening of sub-veins in young leaves. It causes upward curling of the leaves. The leaves become leathery. Foliar outgrowths come from the veins. It causes lengthening and twisting of intemodes. It decreases the yield of cotton. Sometimes, whole crops are destroyed. Necrotic Diseases: In this disease, virus kills the leaf of plant by necrosis. This disease occurs in potatoes and tomatoes. Tumours: Many viruses cause tumours in tomatoes, cucumber and tobacco plants. Tobacco Mosaic Virus (TMV) (only for B.S.) Tobacco mosaic virus (TMV) is an RNA virus. It infects plants, especially tobacco and other members of the family Solanaceae. Its infection causes characteristic patterns. It causes mottling and discoloration on the leaves. Therefore, it is called mosaic virus. TMV was the first virus which was discovered. Tobacco mosaic disease was known from the late 19th century. It was an infectious disease which damaged toAbacco crops. But in 1930 it was discovered that the infectious agent of this disease was virus. Adolf Mayer: He first described the disease in 1883. He found that this disease could be transferred between plants, similar to bacterial infections. Dimitri Ivanovski: He gave the first evidence that this is a non­bacterial infectious agent. He found in 1892 that infected sap remained infectious even after filtering through Chamberland filter papers. Martinus Beijerinck: In 1898, he showed that a filtered, bacteria-free culture medium still contained the infectious agent. Meredith Stanley: He crystallized the virus in 1935. He showed that it remains active even after crystallization. For his work, he was awarded 1/4 of the Nobel Prize in Chemistry in 1946. 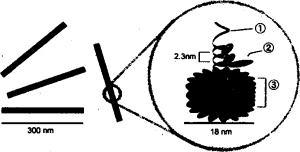 Gustav Kausche and coworkers: They made first electron microscopical images of TMV in 1939. Heinz Fraenkel-Conrat and Robley Williams: They showed that purified TMV RNA and its capsid (coat) protein assemblethemselves to functional viruses. It indicates that this is the most stable structure7. Rosalind Franklin. He was crystallographer. He designed and built a model of TMV. In 1958, she speculated that the virus was hollow, not solid. He hypothesized that the RNA of TMV is single-stranded. Later, this hypothesis was proved to be correct after her death. Tobacco mosaic virus has a rod-like appearance. It is a RNA virus. 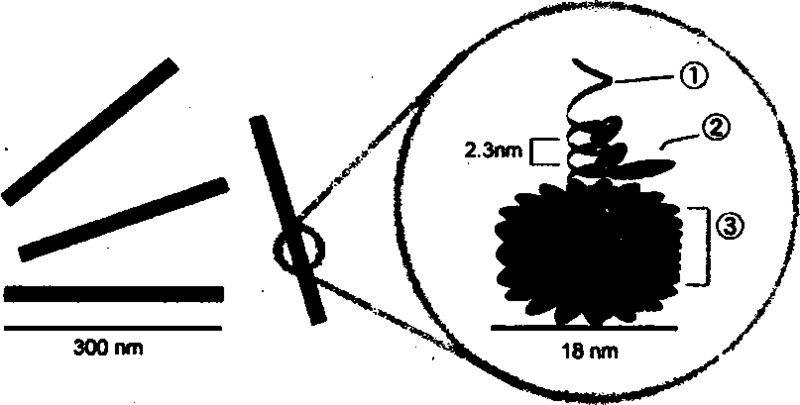 Virions are 300 nm in length and 18 nm in diameter. Negatively stained electron microphotographs show a distinct inner channel of 4 nm. Capsid: Its capsid is made from 2130 molecules of coat protein. 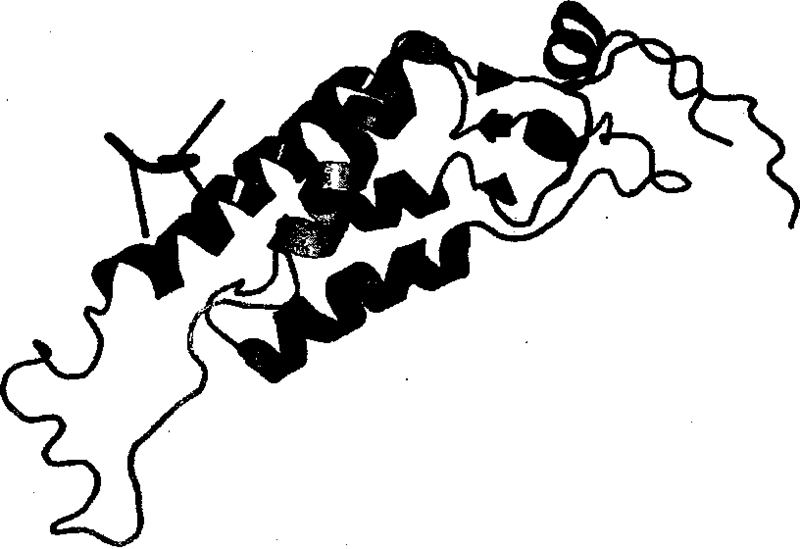 The coat protein self-assembles into the rod like helical structure. The protein monomer consists of 158 amino acids. 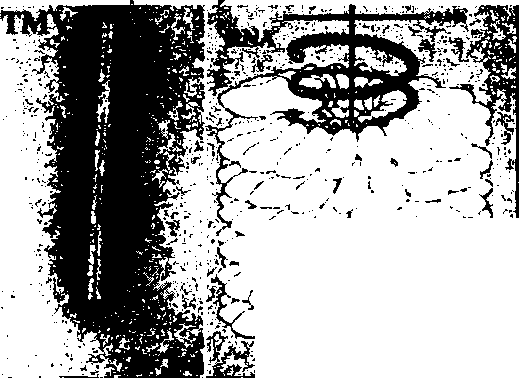 These are assembled into four main alpha-helices. present within the helical structure. This RNA forms a hairpin loop structure. The RNA is located at a radius of 6 nm. It is protected from the action of cellular enzymes by the coat protein. There are three RNA nucleotides per protein monomer. TMV is a thermostable virus. On a dried leaf, it can withstand up to 120 degrees Fahrenheit (50 °C) for 30 minutes. I. The TMV RNA genome is not immediately translated after their entry into the host cell. Instead the RNA is processed by a mechanism that is not yet understood. The resulting mRNAs encode several proteins, including the coat protein. It also has codes for an RNA-dependent RNA polymerase (RdRp). Thus TMV can replicate its own genome. 2. Now the coat protein and RNA genome of TMV have been synthesized. 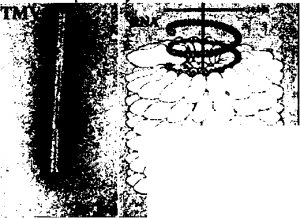 They are spontaneously assemble into complete TMV virions in a highly organized process. The protomers (capsomere) come together to form disks. This disc is composed of two layers of protomers arranged in a helical spiral. The helical capsid grows by the addition of protomers to the end of the rod. As the rod lengthens, the RNA passes through a channel in its center. It forms a loop at the growing end. In this way the RNA can easily fit as a spiral into the interior of the helical capsid. Fig: A monomeric unit of the tobacco mosaic virus coat protein. Penetration and multiplication: TMV infects a tobacco plant. The virus enters mechanically i.e. through a ruptured plant cell wall. It replicates. After its multiplication, it enters the neighboring cells through plasmodesmata. For its smooth entry. 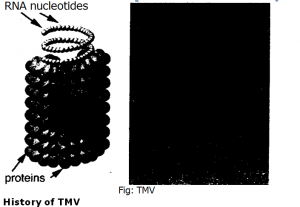 TMV produces a movement protein called P30. This protein enlarge the plasmodesmata. TMV moves from cell-to-cell as a complex of the RNA. P30, and replicase proteins. I. The first symptom of this virus disease is a light green coloration between the veins of young leaves. This is followed quickly by the development of a mosaic or mottled pattern of light and dark green areas in the leaves. These symptoms develop quickly. These are more prominent on younger leaves. early in the season, plants are stunted. Lower leaves are subjected to mosaic burn especially during periods of hot and dry weather. In these cases, large dead areas develop in the leaves. This is the most destructive phases of tobacco mosaic virus infection. Infected leaves may be crinkled, puckered, or elongated. TMV cause a production loss of tobacco of up to two percent in. It infects members of nine plant families, and at least 125 individual species, including tobacco, tomato, pepper (all members of the useful Solanaceae). It also infects cucumbers, and a number of ornamental flowers.